August | 2015 | The Intraracial Colorism Project, Inc.
Join the Editorial Review Board of the Journal of Colorism Studies. Recommended Reading for the Week: “Racism” by Dr. Selena T. Rodgers. The Intraracial Colorism Project, Inc.’s recommend reading for the week is an article titled Racism written by Dr. Selena T. Rodgers, LCSW-R, an assistant professor of Social Work at the City University of New York, York College and a Fulbright Specialist designation from the United States Department of State Bureau of Educational and Cultural Affairs. “The article gives a historical sketch of racism, followed by examples of its contemporary indicators—throughout social institutions—in the United States.” (Rodgers, 2015). To read the article, please visit the Encyclopedia of Social Work . Rodgers, S. T. (2015). Racism. In the Encyclopedia of Social Work. National Association of Social Workers Press and Oxford University Press. Listen to Living Your Dash in Style: Your Legacy of a Significant Life. Living Your Dash in Style: Your Legacy of a Significant Life. 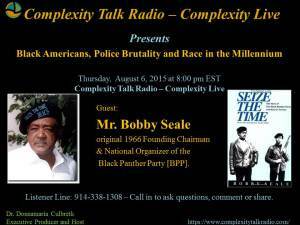 Join Dr. Culbreth and Mr. Bobby Seale ( original 1966 Founding Chairman & National Organizer of the Black Panther Party) for a thought-provoking interview and discussion on Black Americans, Police Brutality and Race in the Millennium. A show you do not want to miss. We will discuss the plethora of issues plaguing Black Americans in the millennium, killings of Black people and other people of color, and moving forward in unity. Call in to ask questions, comment or share.